This may not be how our first encounter with aliens would actually go, but it is a useful illustration of the absurdity of the Earth’s artificially drawn borders and their impact on freedom of movement. The aliens did not know about our borders. They just picked a nice-looking spot somewhere. Ultimately, though, they could have picked any other spot and been treated just the same, because no nation state will let anyone in without the proper papers. As Brecht wrote in Conversations in Exile, the passport is the most precious part of a human being. 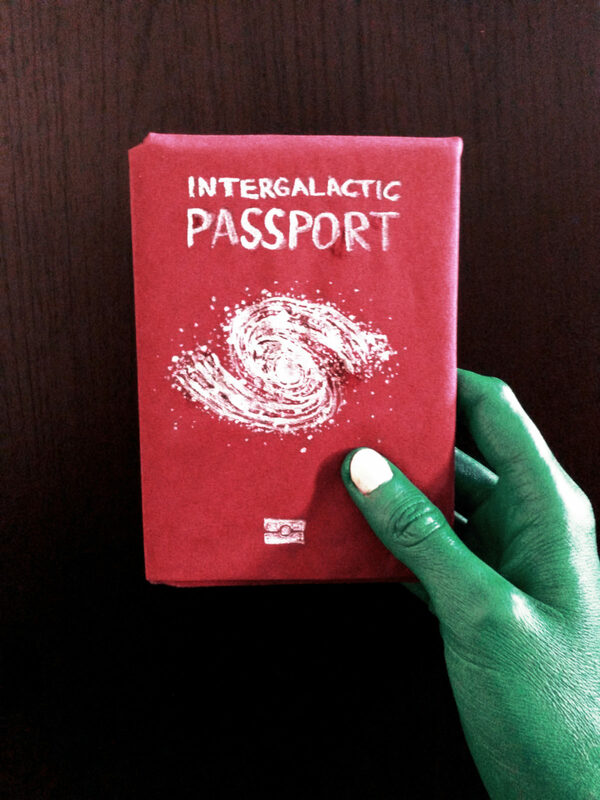 And a good passport will be accepted anywhere, while a human being, however good, may not be accepted. A German passport is a pretty good passport. With it, you can travel to 159 countries visa-free. An Afghan passport, in comparison, is a pretty bad passport, with visa-free travel to only 22 countries (Passport Index 2017). So what has the German national done right to earn this privilege? And what has the Afghan national done wrong (ask the aliens)? The answer, of course, is: nothing. Citizenship is arbitrarily assigned at birth. Seeing as less than 3% of the world’s population change their citizenship in their lifetime, it is an immutable characteristic, much like ethnicity, sexual identity, or gender. And this is where it gets interesting. owing to well-founded fear of being persecuted for reasons of race, religion, nationality, membership of a particular social group or political opinion, is outside the country of her nationality and is unable or, owing to such fear, is unwilling to avail herself of the protection of that country […]. Nationality, in this context, is usually interpreted as being synonymous with race or ethnicity. However, when given its ordinary meaning (doing so is one of the rules of treaty interpretation), nationality can also be interpreted as “citizenship”. This is exciting, because it seems to open up a possibility for people who are citizens of countries affected by issues such as war, famine, or natural disaster to gain protection in another country. People fleeing war, disaster or famine are not usually recognised as Convention refugees. However, it would seem that a citizen of Syria is at risk of dying in the war raging there simply because she happens to have been born in Syria, rather than, say, France. So she is at risk because of her citizenship and should be granted refugee status, right? Well. Refugee law, perhaps unsurprisingly, is more complicated than this. There are three main elements to the refugee definition: persecution, the so-called nexus, and the Convention grounds. Persecution is most easily defined with Hathaway and Foster as ‘serious harm + failure of state protection.’ This “harm” can be any human rights violation (e.g. death, injury, torture, abuse, violence, etc. ), and failure of state protection means that the home country of the person concerned must be unable or unwilling to protect her. We have already talked about the Convention grounds: they are immutable characteristics on grounds of which there must never be any discrimination. The nexus links these two elements by establishing a causal connection between them: persecution must happen for reasons of a Convention ground; e.g. torture must happen for reasons of the person’s religious beliefs if the Refugee Convention is to protect her. The Causal Connection: Intent or Predicament? While, so far, the refugee definition is fairly straightforward, in that the interpretation of the elements discussed above is almost universally accepted in all jurisdictions party to the Convention, there are other, more contentious, questions to it. One such question particularly pertinent to whether a person can be recognised as a refugee for reasons of her citizenship is under what circumstances there will be a nexus between persecution and citizenship. Some argue that the causal connection between persecution and a Convention ground can only be established where the persecutor intends to harm the person in question. A typical example would be a state torturing members of the opposition for their political opinion. Others argue that because the persecutor can also be a non-state actor, a nexus is also established where the state intentionally withholds protection from the person concerned. Here, an example would be a state condoning one religious group attacking another. A third line of argument, however, goes like this: there need not be any persecutory intent in order to establish a nexus. Rather, it is enough to show that it is because of a Convention ground that the person in question is at disproportionately high risk of being persecuted. This is called the “predicament approach” (see Foster) because it concentrates on the predicament of the person being persecuted, rather than the intentions of the persecutor. A useful example to illustrate this is female genital mutilation (FGM). Those who inflict FGM on others (the persecutors) are often women who genuinely believe they are doing this for the benefit of the woman they cut. Thus, they do not intend to persecute her. If this is happening in a state which has outlawed FGM, this state is not intentionally withholding protection, it is merely unable to stop it from happening. Nevertheless, using the predicament approach, a woman at risk of FGM can establish a nexus between the risk of undergoing FGM and an immutable characteristic, namely gender (in terms of Convention grounds, her membership of the particular social group “women”). What does this mean for claims based on citizenship, then? Interpreting nationality as citizenship is not a new idea. In fact, many authors have picked up on this possible meaning but have dismissed it, because they find it unlikely that a state would wish to persecute its own nationals simply because they are its citizens. However, as soon as persecutory intent is taken out of the equation, and the predicament approach is applied, there is a sound basis for arguing that citizenship may form the foundation of a claim for refugee status. To clarify, let us return to the example of the Syrian national at risk of dying in the war. There is persecution (the risk of dying in crossfire, bombings, etc.) and there is her predicament of being a national of Syria, where the conflict happens to be taking place. At first glance, it does not appear like a Syrian national who is at risk of dying in crossfire can make out a claim to refugee status by establishing a nexus to citizenship. In situations of generalised violence, everyone in the territory is at risk, regardless of whether they hold Syrian or, e.g. French citizenship. The difference between the Syrian and the French citizen, however, is that the French citizen can leave Syria legally and safely. Thus, the nexus to nationality can be established because it is citizenship which determines where a person is allowed to go, i.e. it puts her in the predicament of not being able to leave the war zone. Citizenship “traps” its holder in her country of nationality. I concede that it is not usually impossible to leave one’s own country. Syrians have the right to leave their country, and many do so. Nevertheless, ability to leave does not equate to ability to enter, much less stay, in another territory. The right to enter is regulated by visas, applications for which can take weeks to be processed and may be finally denied. In conflict regions, embassies of foreign countries may close and thus make visa applications impossible. Countries that can be reached visa-free (30 for Syrians) may allow entry but not provide durable protection and residency; many are difficult to reach. Thus, the Syrian national at risk of dying in the war is indeed trapped in Syria as she does not have the option to travel legally and safely to a territory where she will find durable protection and residency. This, of course, is why many refugees risk dangerous journeys by sea or by land, trying to reach countries that potentially provide durable protection and residency. Many of those who make it to countries party to the Refugee Convention nevertheless are not deemed to fall within the Convention’s scope, but are instead given complementary forms of protection with fewer rights and shorter durations of residence. My argument is that people with “bad” passports who flee situations of war, famine or disaster ought to be recognised as Convention refugees based on the fact that citizenship is an immutable characteristic, arbitrarily assigned at birth, which puts its holder in the predicament of being at high risk of harm in these situations while being unable to leave. Where this is true, the person concerned should be recognised as a refugee for reasons of her citizenship. And what of the aliens we left in immigration detention at the beginning of this article? If we magnanimously extend our human rights to include aliens’ rights (and assume they came to Earth to seek asylum), the argument applies to them, too. In fact, it also applies to humans without a nationality, because not having a passport restricts one’s ability to travel even more than having a “bad” passport. Perhaps, though, we should just let the aliens get back into their spaceship and fly away. Turns out, we don’t need them to illustrate the absurdity of the concepts of nation-states, borders and passports. What we did to those aliens, we do to humans every day. In fact, we even call those humans “aliens”. What we need to do instead is to acknowledge the discrimination inherent in the global visa regime and as a consequence grant refugee status based on (lack of) citizenship. Maja Grundler holds an MSc in Refugee and Forced Migration Studies from Oxford University, where she focused on the application of the Refugee Convention in the context of flight from armed conflict. She now works and volunteers in the refugee sector. Unsere Zeit’s new series on Citizenship and Territoriality presents international, original contributions on the question of how the interplay of citizenship and territory works in a globalized world – and how it should be, and can be, changed.